With an abundance of swimming pool heaters available, deciding which to buy can be bewildering. Purchase price, operating expenses, yearly maintenance, and other factors will ultimately influence your decision. Electric heaters warm pool water as it circulates around a resistance-type element similar to a home baseboard heater. While they are inexpensive to purchase, electric pool heaters are costly to operate. Possibly suited to small indoor pools, use of an electric heater for a large outdoor pool, especially in a cool climate, is not a feasible option. Efficiency is also an important factor to consider and is measured by Coefficient of Performance (COP), where a higher number equals higher efficiency. For example, an electric heater has a COP of one compared to a heat pump that has a COP of up to seven. They are small and can be installed almost anywhere. They will operate regardless of outside air temperature, making winter use possible. No direct harmful emissions are produced. High operating expenses are possible. Installation requires heavy-duty wiring and an electrical service panel capable of supplying enough power. DIY installation requires extensive electrical knowledge. They're not as efficient as electric heat pumps. Home Depot offers the EcoSmart 18 kW Smart Pool Tankless Water Heater. 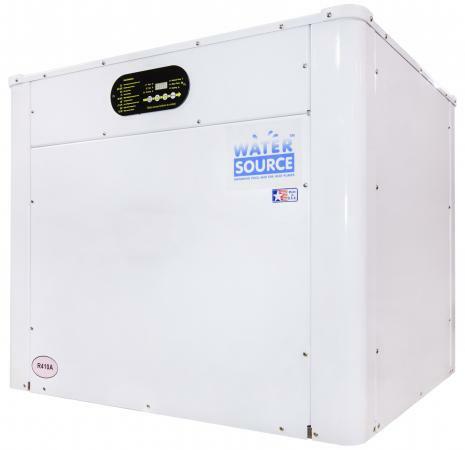 This compact unit heats up to 11,000 gallons and is priced at less than $800. Available through Amazon, the TOPCHANCES Swimming Pool and Spa Heater costs about $340. This 11kW heater is designed for small pools, hot tubs, and spas. Using propane and natural gas as fuel sources, gas pool heaters are the fastest way to heat up your pool. Copper tubing carries pool water through a combustion chamber where burning gas produces heat. 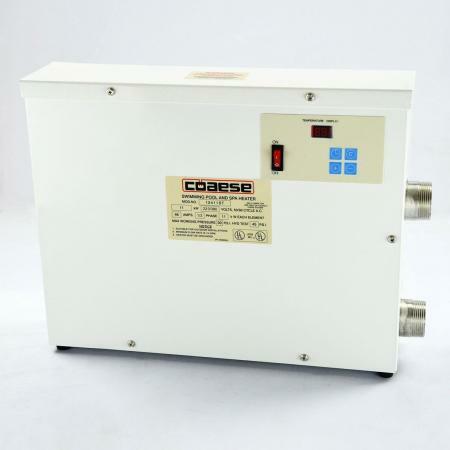 While normally cheaper to operate than electric resistance heaters, gas heaters can be expensive to run. They heat pool water quickly. Gas heaters will operate regardless of outside air temperature, making winter use possible. They can be used with any size and type of pool. Gas heaters can be used with indoor and outdoor pools. Yearly maintenance is necessary to maintain peak efficiency. A large storage tank is necessary in areas that do not have access to a direct gas hookup. Installation must be performed by certified heating and cooling professionals. Carbon monoxide emissions are possible and the use of a CO detector is mandatory. Combustion emissions contribute to air pollution. Priced at less than $2500, the Hayward LoNOx H400HDP is a 400,000 BTU propane heater designed for in-ground pools. Solar Direct has several other high-efficiency natural gas and propane pool heaters available through their website. The Pentair MasterTemp Heater is an above ground heater priced at less than $1000. It delivers 125,000 BTUs of heat and is ideal for pools up to 15,000 gallons. Environmentally friendly and efficient, heat pumps are an excellent choice for pool heating. Similar in operation to refrigerators and air conditioners, heat pumps use a refrigerant to remove heat from outside sources and transfer it to your pool. Operating on electricity, there are two basic types: geothermal and air-source. Geothermal units extract heat from the ground or a source of water; air-source types get their heat from outside air. Geothermal systems are much more efficient than air-source units, especially in cold temperatures, but they are more costly. Operation costs are lower than most other types of pool heaters. Heat pump systems can be used with any type or size of pool. No direct emissions are created. Geothermal units operate regardless of outside temperatures, making winter use possible. Maintenance is minimal but repairs can be expensive if needed. They are more efficient than electric resistance heaters. Initial purchase and installation costs are high. They are slow to heat pool water, but easily maintain water temperature. Air-source models work at a lower efficiency in cold temperatures. Air-source models require an outdoor unit which can be noisy. Gulfstream air-source heat pumps range in price from $2800 to $3700 depending on BTU output. They offer scroll compressor technology for quiet operation, and 100% titanium heat exchangers with a lifetime warranty. The WaterSource WS03-TT geothermal heat pump transfers heat from a nearby water source such as the ocean, a lake, or a well, to your pool. It is available through the AquaCal website where you can contact them for sizing and pricing. 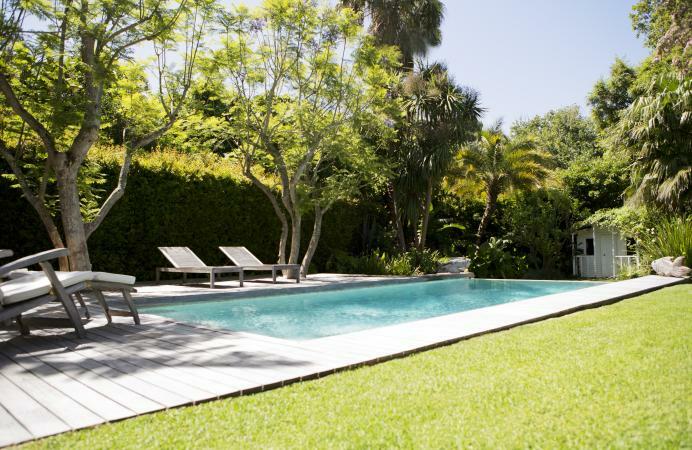 Wood-fired pool heaters are not common, but they are an option to consider. A pump circulates pool water through a heat exchanger or water jacket located inside the combustion chamber. Thermosiphon systems do not need a pump. Based on the principle that hot water rises, warm water leaves the combustion chamber, goes into the top of the pool, and is replaced by cool water from the bottom of the pool. Wood is a renewable energy source. Some units can heat large pools. An electric pump is unnecessary with a thermosiphon installation, making this type ideal for off-grid situations. Advanced combustion designs reduce emissions. Some models are equipped with ovens for outdoor cooking. They can be used as auxiliary pool heat for periodic use during cold temperatures. Installation can be complicated, especially if used for auxiliary pool heating. Burning wood produces smoke and could be bothersome to neighbors. They could be subject to municipal wood-burning restrictions. Maintenance includes chimney cleaning and ash removal. Wood needs to be cut, split, stacked, and loaded into the firebox. There's less pool temperature control than other systems. Warm Water Solutions sells a variety of wood-fired pool heaters, from 125,000 BTU models to 350,000 BTU units for large pools. You can check out their website for more details and contact them for pricing. WSP (Wood Stove Pools) offers several wood pool heaters, including models with a pizza oven for outdoor cooking. You will find contact information for pricing on their website. Using the sun as a heat source is a natural and environmentally friendly choice. Several types of solar pool heaters are available, including evacuated tube collectors (ETCs), flat plate collectors, integral collector storage (ICS), and polymer coil and mat systems. Similar to other types, they all have their advantages and disadvantages; you'll want to compare costs and installation, too. When choosing a pool heater, consider the size of your pool, whether it is located inside or out, if you plan to use it seasonally or year round, and your climate. Opting to buy a high-efficiency heater is an environmentally friendly choice and will save you money in the long run.